I was 21 when I got my first proper fishing rod, my boyfriend at the time bought it for me and we embarked on numerous trips, trying different bait, different locations, by boat, on wharf, surfcasting from the beach and all were pretty miserable - not one fish was caught that year, so my love affair of fishing ended and so did my romance. 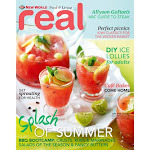 These days, I envy those who can fish, I never realised how aligned everything needs to be in order to hook a 'big in'. Weather patterns, moon phases, the right hook, bait, sinker. . . now I just leave it up to the experts, which is usually the Auckland Fish Market - which is exciting in itself just to visit and see the different species, colors, shapes as well as a great place for fish n chips, and a cold beer. It was also recommended in our Best eating places to take the kids list, as it has a massive courtyard with a sandpit, and also the marine inspired playground across the road. 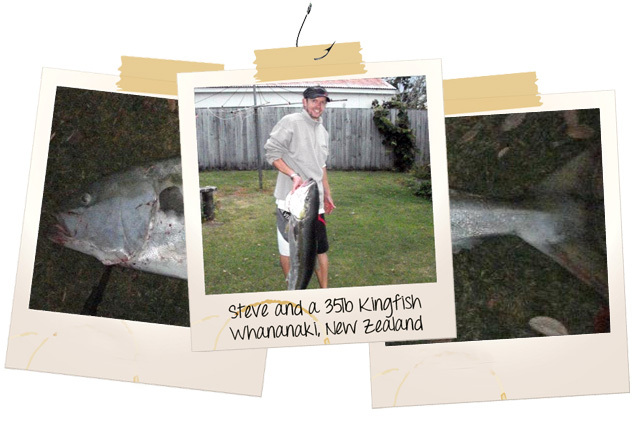 The whole reason for this post, is because my neighbour, Steve, turned up with some Smoked Kingfish, caught from a recent trip to Whananaki, (40 minutes drive northeast of Whangarei, North Island, New Zealand) he hooked a 35lb Kingfish and my, what a catch! It's was quite a dry texture, so I decided the best thing to do was to make a quick pate/ dip for lunch. Because the pate was so easy to make, and I'm never one to rest on any success, I decided to make the bread as well, which unfortunately went the same way as my fishing - lets just say it was super crunchy, and enjoyed as soon as it exited the oven, but a few hours later, it was used for cricket balls in a match in the backyard. So what went wrong with my bread? How to make: Brush tray with oil. Mix flour, salt, yeast in a bowl. Make well in centre. Pour in water and mix to a firm dough. Add more flour if necessary. Transfer to floured surface and knead for 10mins until smooth and elastic. Brush inside of another bowl with oil and place dough. Cover with cling film and leave to rise in warm place for an hour (I used my hot water cupboard and I left it for 3 hours!!!). Turn the dough out on floured surface and punch down. Knead for 3 mins and divide into two thirds and one-third, shape each into a ball (I divided the dough into 12 rolls). Place on oiled tray. Brush the tops with oil (I also added sesame seeds) Leave the dough to rise in a warm place for a further 30 mins. (I left it for about an hour and when I saw how much they had risen, I thought, my rolls were way too BIG, so I re-sized them into smaller rolls - round shaped and oblong, not really kneading the dough much again, just reshaping). Preheat oven to 220C. Bake on the bottom of the oven for 40mins until loaf is golden. Serve warm. The Outcome: My rolls were too hard and too dense. Steve's wife and ex chef, Johanna recommended: Use the dough hook on your kitchen mix, you may not have kneaded the bread enough. 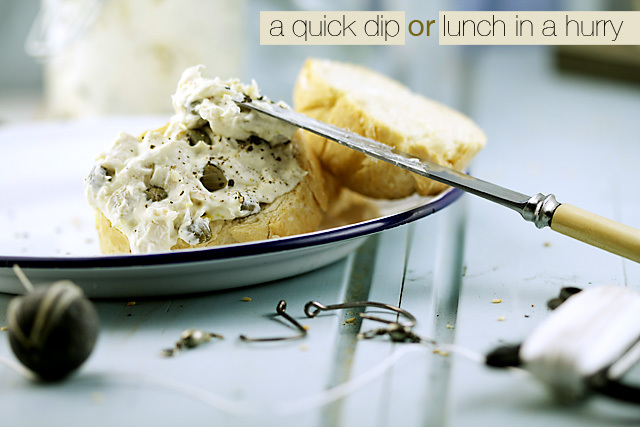 In a bowl, put cream cheese, milk, lemon juice, zest and fold through flaked fish and capers. Add salt and pepper to taste. Chill until needed. 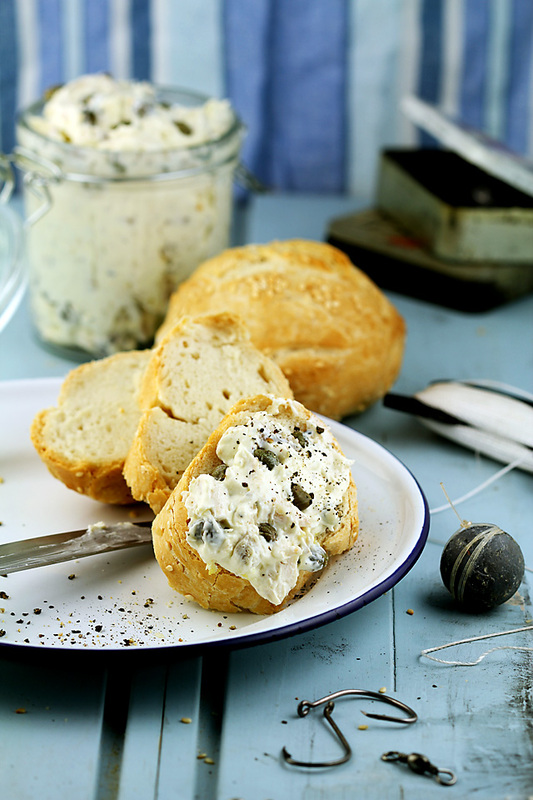 Serve with crackers or crusty bread. it might not be you RE the bread. If you used a bread maker it can take a few trials before getting used to the breadmaker and editing the recipe slightly. If you made it by machine/hand it could be many things including resting, proving, proving temperature, order or adding ingredients and kneading. Despite this your problem sounds like a breadmaker problem to me. Hi Kevin, I didn't use a breadmaker, just me, the ingredients and my 'new to kneading' hands. I quite often make pizza dough as well, and I always find it's quite hard and crunchy too, but it doesn't seem to matter too much as its thin bread. I'm going to repeat the recipe and follow it exact, maybe kneading it for longer (or using the dough hook on my mixer) I'll keep you posted! i think i might make a big bowl of that dip and eat it for easter friday dinner !! I was wondering if you would like to put up a link to this fish/seafood recipe in my Food on Friday Series. Your dip just looks wonderful.